Cygnus X-3 is an X-ray binary where a compact source is pulling material away from a massive companion star. Chandra's high-resolution X-ray vision revealed a cloud of gas and dust that is a separated by a very small distance from Cygnus X-3. This gas cloud, dubbed the "Little Friend," is a Bok globule, the first ever detected in X-rays and the most distant one ever discovered. Astronomers detected jets produced by the "Little Friend", showing that a star is forming inside it. A snapshot of the life cycle of stars has been captured where a stellar nursery is reflecting X-rays from a source powered by an object at the endpoint of its evolution. This discovery, described in our latest press release, provides a new way to study how stars form. This composite image shows X-rays from NASA's Chandra X-ray Observatory (white) and radio data from the Smithsonian's Submillimeter Array (red and blue). The X-ray data reveal a bright X-ray source to the right known as Cygnus X-3, a system containing either a black hole or neutron star (a.k.a. 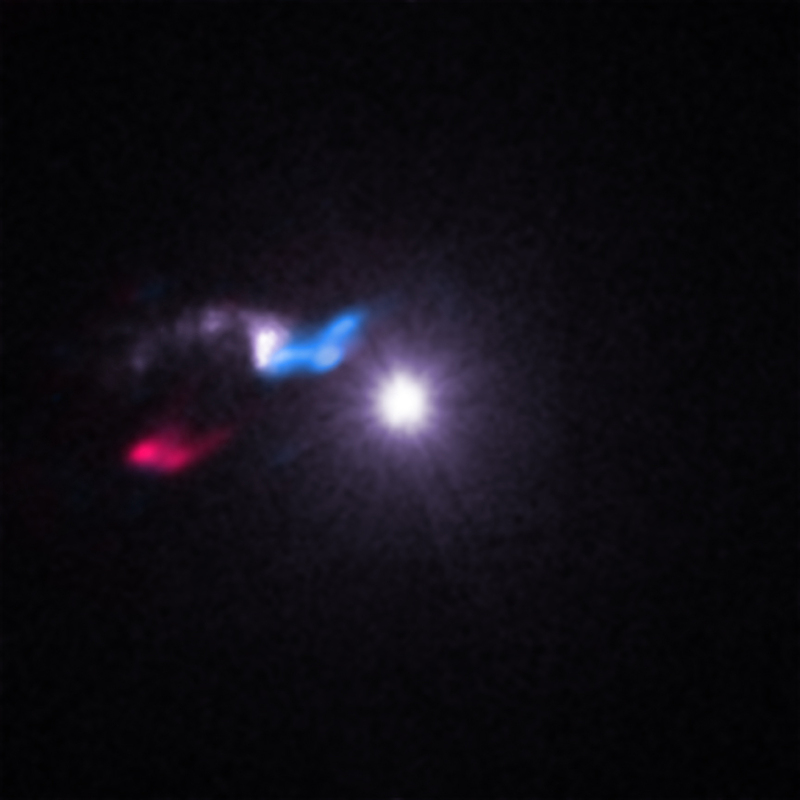 a compact source) left behind after the death of a massive star. Within that bright source, the compact object is pulling material away from a massive companion star. Astronomers call such systems "X-ray binaries." In 2003, astronomers presented results using Chandra's high-resolution vision in X-rays to identify a mysterious source of X-ray emission located very close to Cygnus X-3 on the sky (smaller white object to the upper left). The separation of these two sources is equivalent to the width of a penny about 800 feet away. A decade later, astronomers reported the new source is a cloud of gas and dust. In astronomical terms, this cloud is rather small - about 0.7 light years in diameter. Astronomers realized that this nearby cloud was acting as a mirror, reflecting some of the X-rays generated by Cygnus X-3 towards Earth. They nicknamed this object the "Little Friend" due to its close proximity to Cygnus X-3 on the sky and because it also demonstrated the same 4.8-hour variability in X-rays seen in the X-ray binary. To determine the nature of the Little Friend, more information was needed. The researchers used the Submillimeter Array (SMA), a series of eight radio dishes atop Mauna Kea in Hawaii, to discover the presence of molecules of carbon monoxide. This is an important clue that helped confirm previous suggestions that the Little Friend is a Bok globule, small, dense, very cold clouds where stars can form. The SMA data also reveal the presence of a jet or outflow within the Little Friend, an indication that a star has started to form inside. The blue portion shows a jet moving towards us and the red portion shows a jet moving away from us. These results were published in The Astrophysical Journal Letters, and the paper is also available online. NASA's Marshall Space Flight Center in Huntsville, Alabama, manages the Chandra program for NASA's Science Mission Directorate in Washington. The Smithsonian Astrophysical Observatory in Cambridge, Massachusetts, controls Chandra's science and flight operations. Coordinates (J2000) RA 20h 32m 25.50s | Dec +40° 57´ 27.70"
It's interesting what nature can show you once you have the technology to see. We live in a most wonderful period of time. The universe is out there to explore. The image shows what appears to be two almost equal jets on either side of The Little Friend. Might there be there two protostars here or is it a case of gravitational lensing... or perhaps another explanation. How exciting. Love the name little friend. Cannot wait to share this with my students. About 8.15 light years across. X-rays are purple and radio blue and red.